One of the most sought after rebuildable tanks/clearomizers on the market, the Lemo 2 is Eleaf's answer to a high demand for sub-ohm tank systems. It features a fairly large capacity and requires the user to build their own coil systems. One of the most sought after rebuildable tanks/clearomizers on the market, the Lemo 2 is Eleaf's answer to a high demand for sub-ohm tank systems. It features a fairly large capacity and requires the user to build their own coil systems. The tank itself holds over 3 mL of liquid (depending on coil size and build), and the deck has plenty of room to build on since you can remove it from the tank. It features two building posts that are PEEK insulated for extra safety. The stock coil is prebuilt and stuffed with cotton, at 0.5 ohms. The Lemo 2 is compatible with builds of 0.3 ohms or above, and will work on a wide wattage range (up to 80 watts for a 0.3 ohm coil build). 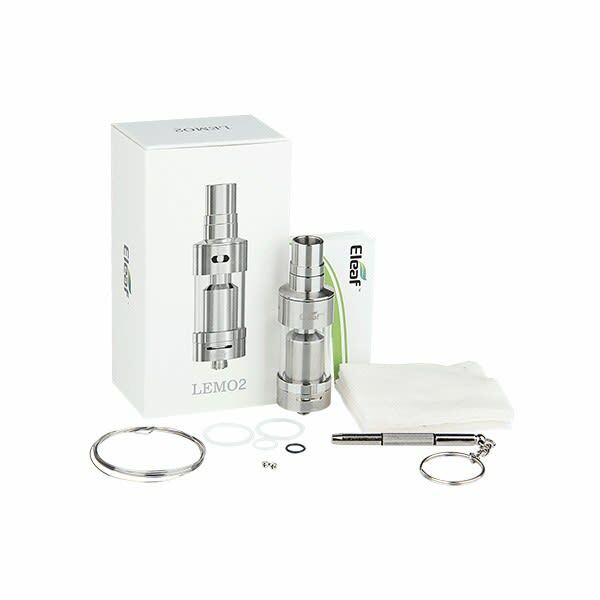 Leakage is minimized on the Lemo 2 due to its revolutionary new method for filling - there is a ring at the top of the tank with a fill hole that you can manually open or close. When filling, be sure you tighten the airflow at the base of the tank before opening up the fill hole near the top of the tank. Be patient when filling, and avoid touching the nozzle of your juice bottle to the components on the inside of the tank for optimum performance and minimum leakage.